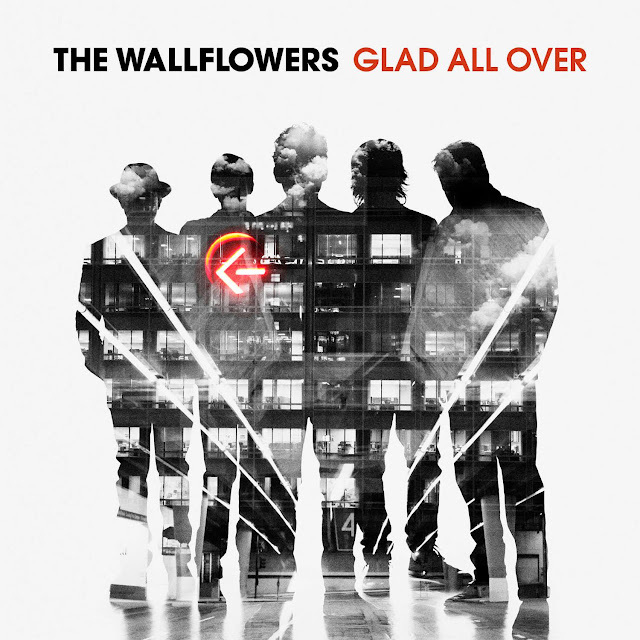 MUSIC REVIEW: The Wallflowers-"Glad All Over"
Hello, dear readers! I On the Arts is back again! Did you miss me? Possibly. Do I aim to entertain with my reviews of various artistic things? Of course. Let us commence! October 9, 2012 was the release date of the Wallflowers’ highly anticipated latest effort, Glad All Over, which comes after a 7-year hiatus. The Wallflowers (my second-favorite band, after Nightwish) were founded by and are led by Jakob Dylan, son of Bob Dylan. They have been making and recording music since 1989 and play a melodic brand of alternative rock that takes cues not from Bob, but rather from Tom Petty. The band achieved great success following their acclaimed 1996 album Bringing Down the Horse and their anthemic single “One Headlight”, a song many people recognize as familiar without realizing they know it. Bringing Down the Horse was followed by the equally brilliant if much less popular effort (Breach) and the band gradually lost the spotlight with their subsequent releases. In 2005 the band decided to take a break as Jakob focused on his solo career, which was enjoyable if less satisfying than his work with his band. I began listening to the band in 2009-2010 and soon fell in love with their catchy rock melodies and with their Dylan-penned lyrics, many of which create wistful, thoughtful moods and are keen meditations on love and romance. I count Bringing Down the Horse and (Breach) among my favorite albums of all time. For me, the Wallflowers’ music evokes memories and emotions. Fortunately, for those fans waited with bated breath, this Wallflowers album is a strong addition to their discography. It far surpasses their 2002 and 2005 efforts with its familiar yet varied sound; it weaves together variations of the typical Wallflowers style in a satisfying way. Glad All Over combines some of the best elements of their previous albums into one fresh, enjoyable ride, anchored as usual by Jakob Dylan’s pleasantly hoarse and textured vocals. The album is chock-full of catchy tunes that almost beckon the listener to sing along. Many tunes are wonderfully memorable and are right up there with best of the Wallflowers. “Hospital For Sinners”, the opening track, is fast-paced and engaging. “Misfits and Lovers”, one of the first tracks, will take up residence in your head and refuse to exit. “Misfits and Lovers” is truly the highlight of the album, a classic Wallflowers tune, with a memorable chorus. “First One in the Car”, another early track, harkens back to “One Headlight”, with its low-key intensity and faint organ. “Love is a Country” is a wistful quasi-ballad about the nature of love, borrowing folksy influences from Jakob’s solo work, conjuring up images of windswept lovers crossing a desert. “It’s a Dream” is a haunting, almost jaunty tune played out over thundering keys, creating an unsettling atmosphere. “Have Mercy on Him Now” is a straight rock song à la Bruce Springsteen, a format at which the Wallflowers have always excelled, and is similar to “Laughing Out Loud” from Bringing Down the Horse, a welcome fountain of influence. “The Devil’s Waltz” is a departure for the band, as it dips into more country influences with its more minimalist sound and cheeky atmosphere. “It Won’t Be Long” is more classic Wallflowers, sounding very similar to “Angel on My Bike” from Horse. “Constellation Blues” is another quasi-ballad with a pleasing meditative, almost nostalgic feeling. The closing track, “One Set of Wings” also replicates the ballad sound, with a warmth and gentleness amid the rock aspects that cradles the listener in the chorus with Dylan’s fatherly, comforting voice. Perhaps the least satisfying track on the album is the track with which the band announced their official return, “Reboot the Mission”, which features Clash member Mick Jones. It is not that the song is inherently bad or unpleasant, but with its unfamiliar punk-ish influences, it absolutely pales in comparison to and even feels a little out of place among the rest of the songs. Another weak point plaguing the album is the relative shallowness of the songs. Unlike songs from their earlier masterpieces, this set of tracks lacks the same type of eternal replay value and lyrical depth. The themes on this album seem to be a restatement of typical Wallflowers material, with nothing truly striking. The lyrics pale in comparison to the melodies the band has crafted for this effort. There are also several songs that sound similar enough to blend together, and as with earlier Wallflowers efforts, the album’s weaker tracks are at the end and are softer songs that lack the vigor and impact of the songs at the beginning of the album. “Have Mercy on Him Now”, while a good song, seems like filler. This album is a good illustration of the larger question that many veteran musicians often have to face when creating new material: how to balance the need to expand musically while still remaining true to their roots. Unfortunately, here, the Wallflowers dip their toes into foreign territories on only one song, and play the rest rather safe and thus, that song does not follow the flow of the rest of the album. Overall, this album is a strong return for the much-missed Wallflowers, and a good addition to their discography. For their next effort, I hope the Wallflowers commit to a true "Reboot", if you will: an album a little out of their comfort zone, something with true brilliance and freshness about it. I have to buy this now and compare my thoughts to yours! I usually like the way the Wallflowers' words and music complement each other to create a complete message so I am curious to see about your comments that the music outdoes the lyric on this release. Thanks for your insight!